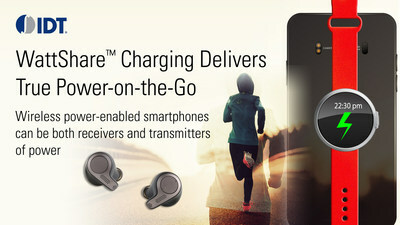 IDT's WattShare Technology Enables Smartphones to Wirelessly Charge Other Mobile Devices and Accessories | Integrated Device Technology, Inc.
SAN JOSE, Calif., March 28, 2019 /PRNewswire/ -- Integrated Device Technology, Inc. (IDT) (NASDAQ: IDTI), today launched the WattShare™ family of wireless power semiconductors that enable smartphones to wirelessly charge other mobile devices. IDT's new wireless power ICs uniquely combine receiver and transmitter capabilities, allowing smartphones, smartwatches, truly wireless ear buds and other devices to be wirelessly charged simply by placing them atop a smartphone. "WattShare-enabled smartphones will free users from carrying a variety of chargers and constantly looking for electrical outlets to keep their smartwatches, ear buds and other devices charged," said Christopher Stephens, general manager of IDT's Wireless Power Division. "WattShare is the latest example of IDT's continued advancement of the state-of-the-art in wireless charging technology and places the smartphone at the center of the wireless charging eco-system to ensure consumers can enjoy the most 'untethered' smartphone experience." Several leading smartphone makers have already adopted WattShare and have successfully created a wireless charging ecosystem allowing their customers to charge a friend's phone or an accessory device. More information about IDT's WattShare technology is available at idt.com/wattshare. IDT is the global leader in wireless power solutions for both the Power Receivers (PRx) used in smartphones and other applications, as well as the Power Transmitters (PTx) used in charging pads and automotive in-car applications. Visit idt.com/wirelesspower to learn more about IDT's wireless power solutions.